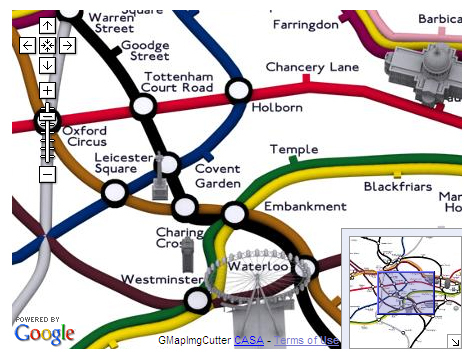 London Tube Map Traditional Layout from digitalurban on Vimeo. Taking this one step further, they've morphed this with plasticine look of the lines into a Google Map. There are a few errors here and there but it should only need a few tweaks to be near a complete version which can then be morphed and changed as needs be." You can also also see the 'Google Maps' version in full screen. There's more about their mapping here. Many thanks to Ianvisits for the heads up to this. I love a lot of these creative visualisations of the map and seeing the geographical map from this perspective is leaps on from Simon Clarke's original Geographical Map that it was based on. 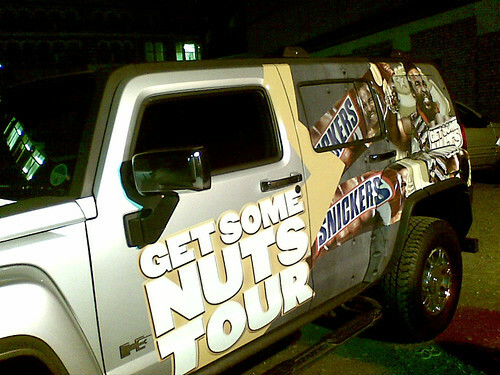 One person who's used to hanging out of helicopters and is very used to seeing in air city scenes is Mr T. Last night I was lucky enough to meet him as part of his Snickers Get Some Nuts tour. 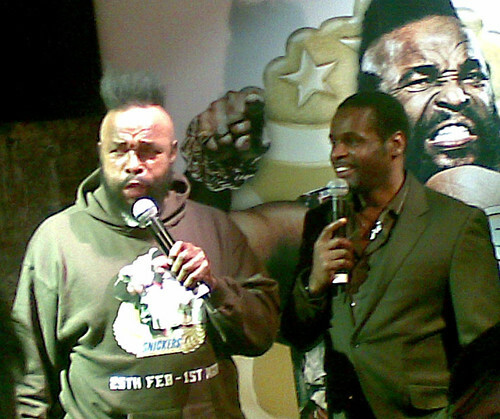 Typically my camera ran out of battery juice during the night, but there's a mixture of pictures from my Canon and my cameraphone in the following Mr T in London set. 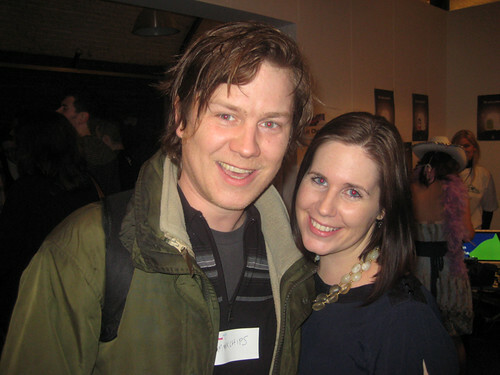 You'll also spot Craig out of the very first Big Brother in some of them! 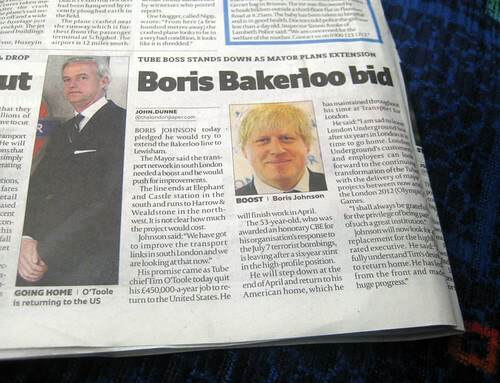 With Tube boss, Tim O'Toole's resignation yesterday, Boris Johnson pledged an extension to the Bakerloo Line on the London Underground. At the Mayor's Question Time London Assembly member Val Shawcross asked what Boris had done to help the regeneration of Elephant & Castle station at the end of that line. 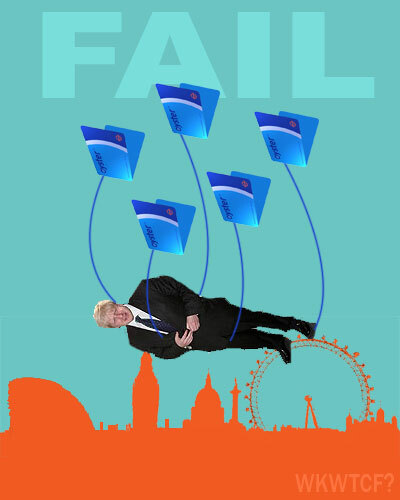 Ms Shawcross told the Mayor that his record on the Elephant & Castle was one of "delay and delay and delay" and as a result Johnson has promised to visit it. Last year Johnson first suggested using tunnelling machines purchased for Crossrail to extend the Tube in South London once the east-west link was finished. 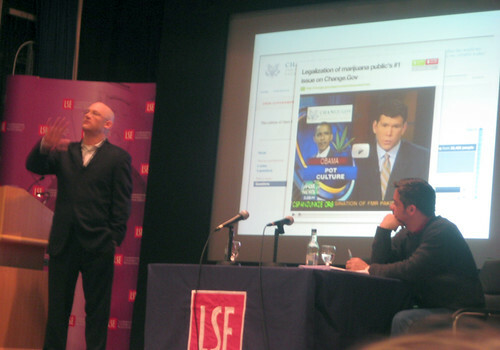 "Everything you have done with regard to the Elephant & Castle has stalled that major regeneration scheme: you dropped the tram project, you stalled ... the replacement of the dangerous fast roundabout and appalling underpasses, TfL have stalled on the discussion with Lend Lease and the council about the cost for the Underground station and the whole project cannot be signed off until that information is provided." So Boris has agreed to do visit the area as long as Ms Shawcross also comes along her bicycle! He said: "Insofar as you are correct that TfL are the major blockage in delivering what we want to see at the Elephant & Castle then I will certainly do everything in my power to remove the blockage." 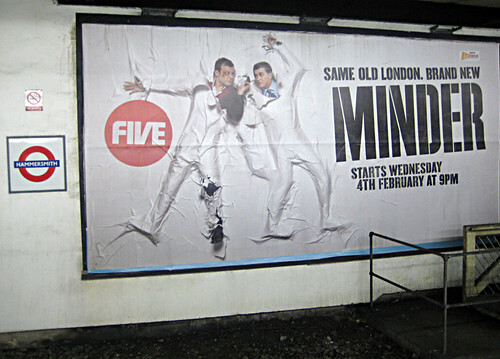 See London SE1 for more on this. An extension to the Bakerloo Line would certainly help the great "North / South divide" as the Tube is certainly lacking in stations south of the river. 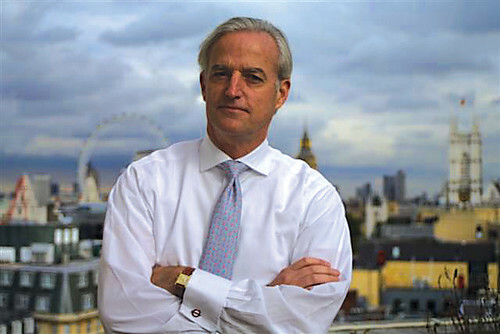 Tim O'Toole, the Tube's Managing Director, has resigned and will be returning to the US. The official reason given for O'Toole's resignation is that he wants to spend more time with his family back in the US. However, as the Daily Telegraph says "they have always lived in the US during Mr O'Toole's six years at LU and, until now, he was happy to return at regular intervals to visit them." The unofficial reason for the resignation is that it's part of a growing row over the multi billion pound shortfall in the public funding for the Tube's upgrade. Ken Livingstone was quick to show how this is a blow for Boris Johnson, who would have been relying on Tim O'Toole's experience and skills to ensure that as much of the upgrade as possible survived. Livingstone said "I find it the most unbelievable incompetence and lack of interest in the lives of Londoners for Boris Johnson to lose one of the best public servants London has seen. I want to thank Tim for his service to our great city. His unique personal qualities and professional talent, which won the hearts of all who worked with him, will be sorely missed." "Tim has led LU to its highest levels of performance while carrying record numbers of passengers - all at a time of great change as billions are invested to improve the Tube. His leadership was exemplified by getting London moving again so quickly after the terrorist attacks of July 2005. We will greatly miss him as a colleague and I will miss him as a friend". TfL's website said his role will be advertised shortly. Thanks to Brian Pigeon for giving me the heads up or rather beaks up to this. 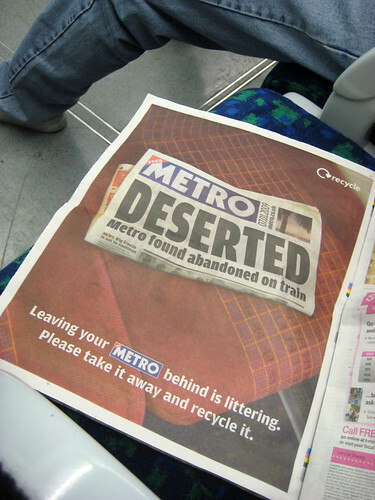 Metro are trying another approach to tidy up the London Underground in the mornings, by running ads encourage commuters to recycle their papers rather than "desert" them. However, it didn't seem to be working that well yesterday, as I saw the usual pile of Metros (with this very ad in them) on the little ledge behind the seats on the Piccadilly Line. I must admit that I used to regard it as a personal service to my fellow commuters to leave my Metro behind for others to read. However, with londonpaper in the evening, I always recycled it. 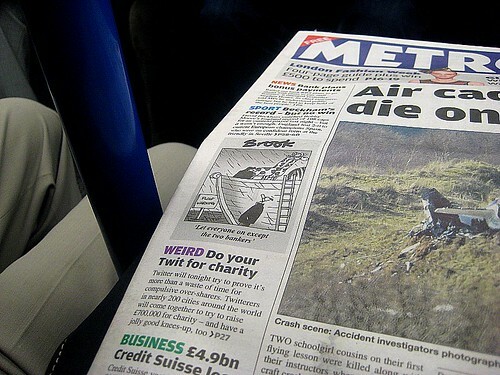 I bet Metro also use copies "passed on" in their total readership figures. 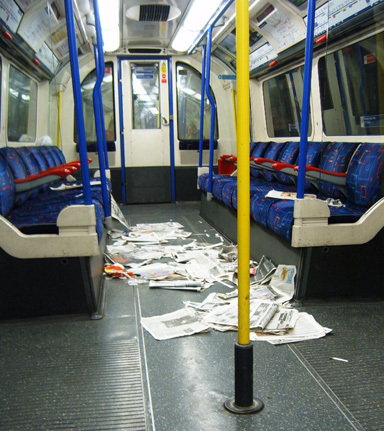 But since I've seen the paper "mountain" in a number of Tube carriages, I always take any paper away with me. 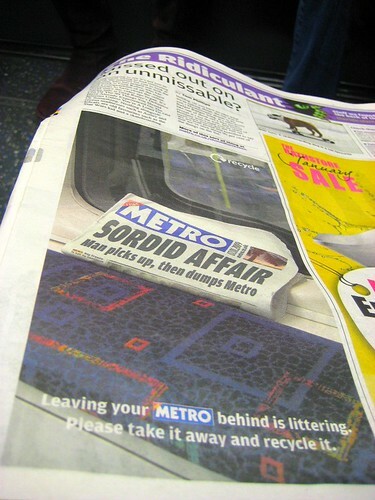 Metro & other free-sheets have tried a number of initiatives to stop people leaving papers behind, from sponsoring recycling bins outside Tube stations in Westminster & a few stations in outer zones to getting staff on the London Underground to make announcements about taking your papers with you. 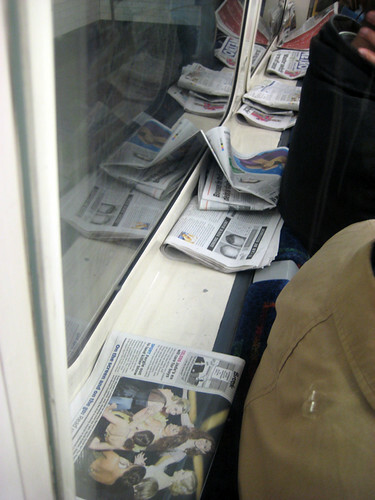 Apparently London Underground commuters left behind nine and half tonnes of free newspapers behind every day and that was just on the Piccadilly, Northern and Jubilee lines. Tube Lines said "There has been a huge increase in the numbers of free newspapers being left on trains; typically 9.5 tonnes are picked off trains each day now, compared with three tonnes in the past". Maybe the new ads in Metro will work with some people, but it certainly didn't make much difference with some of my fellow commuters on the Piccadilly Line. Someone looks like they were a bit troubled on the London Underground heading to Heathrow, if the scrawled message on following ad is anything to go by. I was at the Football 3's soft launch with my friend Utku who works for Mint Digital (great idea to turn their meeting room into a pub, by the way) and he showed me a photo he took on Sunday. The ad was extolling the virtues of Tube as the best way to fly, but someone else reckoned that getting a train would be better than flying. Maybe it was a message about saving carbon footprints rather than a speed issue though. 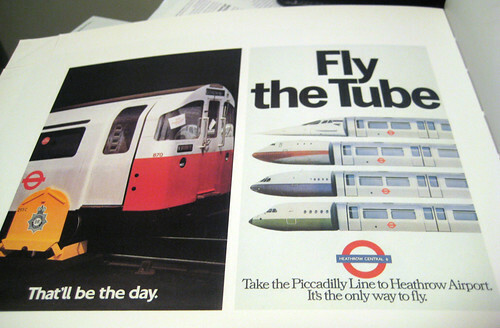 Either way, the ad about Heathrow reminded me of an London Underground ad from the Seventies, which promoted the Tube as "The only way to fly". So I grabbed my Underground Art book and sure enough, the ad, with it's very Seventies looking typeface, was there. 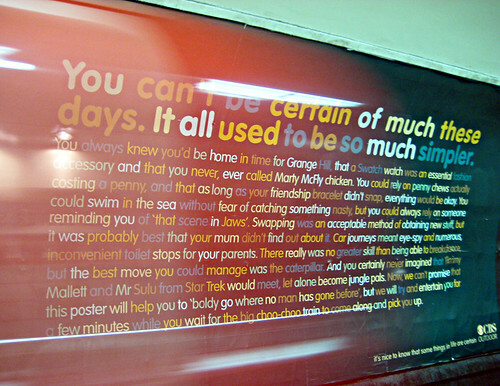 As you can see, it's next to another more striking ad showing a clamped Tube. The ad on the left is from 1984 & refers to when wheel clamping was introduced. "The absurd image of a clamped Tube train makes the advantage of Underground travel immediately obvious" wrote Oliver Green in the book. However, as I live reasonably close to Heathrow, I usually take the opposite approach and take a taxi rather than a Tube to the airport. It's faster for me as I don't have to faff around with my luggage on a packed Tube or deal with interchanges. But loads of people do get the Tube to Heathrow rather than the Heathrow Express. I've never taken the Heathrow Express, but I have missed a flight through being stuck on the Gatwick Express, so I wouldn't see the train as the "only" way to fly. In the last couple of weeks I was reminded that not everyone knows who Inspector Sands is. 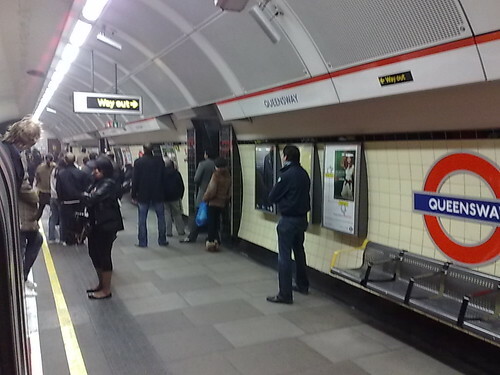 My friend Jemimah was evacuated from Queensway Tube station a couple of weeks ago due to a small fire. In true British fashion everyone left the station in an orderly fashion. Jemimah said "People were more curious than panicked. Over the tannoy we first heard "There is a good service on the Central Line" which mildly amused most of us. Then there was a repeated tannoy message asking for Inspector Sands again and again. If I was paranoid I would have thought that was code - it was certainly a recording rather than live tannoy call. Then we were told to please leave the station." "This was getting really creepy. A dark platform with hardly a soul anywhere and a dismembered voice eerily repeating the same message over and over in the exact same manner. Since it sounded like it could have been a recording, and by now my curiosity was well and truly piqued, I Googled the phrase. I expected to get no results, assuming that it really was a staff announcement, albeit a strangely delivered one." After Googling he learnt that it's a coded phrase (which I actually thought a lot more people knew about) to alert staff to a fire alarm going off but without having people running around Dad's Army stylie saying "Don't Panic, Don't Panic"
"Smart. A bit more research and I found some TfL staff saying that it usually means a fire alarm has been tripped and 90% of the time it's a false alarm. There's even a couple of theories on the origin of the name Inspector Sands. "The use of the word "Sands" may be a pun on the fact that staff must investigate and reset the alarm system before a set period of time elapses, as might be measured in a sand-timer, and the station systems automatically switch to a fail-safe evacuation mode. Alternatively, it may reflect the fact that sand can be used to put out fires." Apparently the Sands name came from theatre evacuation code. Mr Gravel was the code name for a bomb alert. But Inspector Sands is pretty common now, I wonder why don't TfL don't have another code name for the fire alarm being triggered? 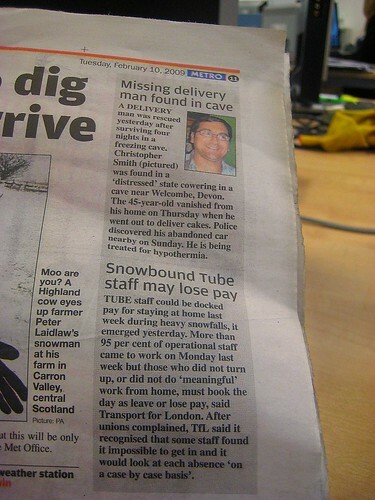 It must be a bit awkward if your surname is Sands and you work for the London Underground. Does this mean that you could never be promoted to "Inspector" level? Otherwise you'd be making your way to the control room quite a few times under false pretences. I'd also like know if there are more coded Inspectors who are called for on the London Underground? Like making an announcement for Inspector Ash if people are seen smoking on a platform, or asking for Inspector Boris if there are people drinking on the Tube? Following the sad snogging stoppers at Warrington Bank Quay station, Chiltern Railways have decided they welcome kissing with open arms. The poster at High Wycombe station above says: "Unlike other train companies, we would never dream of banning kissing at our stations." In fact they want to encourage love and romance and are running a competition to promote the romance of railways "where fond farewells and emotional reunions take place, where relationships start with a glance and even, in the case of our Marylebone station last November, where one passenger will propose to another over the public address system!" "To show that we are dedicated to spreading a little love around our stations, we are asking our passengers to send us a photograph of them kissing at one of our stations. From Birmingham Moor Street to London Marylebone, we've got lots and lots of picturesque stations, perfect for that romantic moment." "The couple in the winning photograph will win free travel to and from London and a romantic champagne afternoon tea at London's exclusive Landmark Hotel. So pucker up and get snapping!" You've only got till the 3rd of March to get snogging & shooting. Full details of entry are on Chiltern Railways' site. They've certainly got a point about the romance of railway stations. Even St Pancras International commissioned a statue of a kissing couple for the centrepiece of their station. Good luck to Chiltern Railways as it's a good way of saying one in the eye to Virgin Trains who issued the no kissing zones. If you struggling to keep the kids entertained this half term, today sees the launch of The Big Womble. It's a project which aims to recycle and reuse unwanted furniture (like the Wombles did back in the day). At Wimbledon College today there's a whole range of events including furniture painting & fixing and an auction for some celebrity cast offs including Barbara Windsor's footstool and a butcher's block from Tony Robinson. Here's a map to help you make your way there. Activities start at 2pm and run till 6pm. Also the London Transport Museum is running a number of half term activities including the rather sound instruction to "Don't Let the Pigeon Drive the Bus" on 21st February. 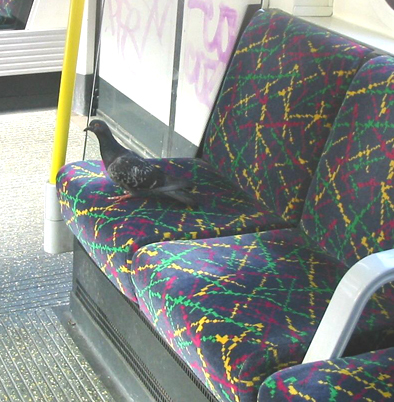 "When a friendly bus driver takes a break from his route he leaves the audience with one simple instruction, "Don't let the pigeon drive the bus!". But, the cute blue pigeon is very clever. He begs the audience to let him drive the bus while the bus driver is gone. He pleads, whines, bribes, and even sings a song to get his own way - he wants to drive that bus!. Will he, won't he? ... the suspense is too much." There are two shows at 12.00 and 15.00. Just don't let Brian Pigeon know about them, otherwise he'll be hopping on the Tube pretty sharpish to get in on the act. His sweary antics aren't really safe for kids. 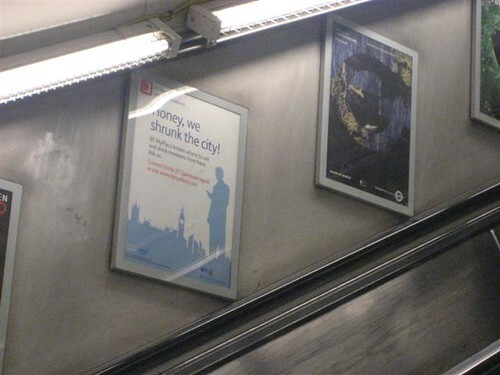 You might have seen a number of ads on the London Underground about shrinking the city. 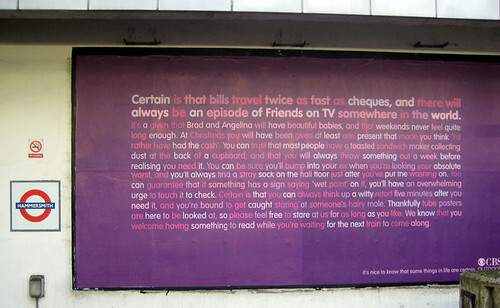 They're all for a new "pocket concierge" service from BT, called BT Myplace. It's a free WiFi enabled directory in Westminster, so if you register your personal preferences (including favourite grub, hobbies, type of shops), you can find nearby recommendations based on those favourites and their location. What's the name of the disused Tube station at Aldwych? BT MyPlace will pick the winner and I'll announce who the lucky person is as soon as I know it. I wouldn't be able to enter the competition but those who know me personally, know how much I bang on about my wonderful Acer Aspire Netbook. 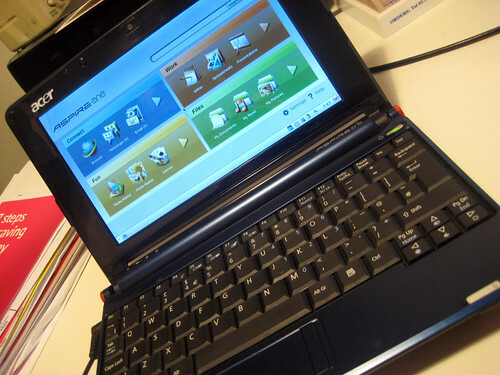 It's a fantastic little computer which is really unbelievably light, has a nice keyboard for people with normal or chunky fingers like me, picks up wifi very well and is a brill back up laptop if you're on the move. Don't hold your breath if you're waiting to hear what went wrong with Metronet, as a National Audit Office report on it is four months behind schedule. 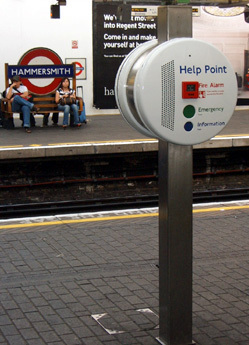 Metronet, was the private-sector consortium contracted to renew and maintain two-thirds of the Tube, and went into administration in July 2007. 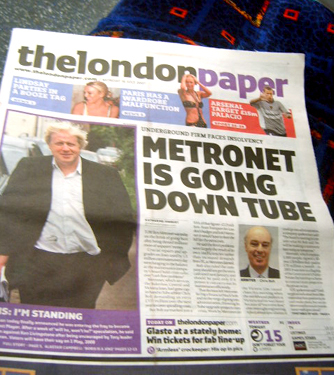 The Independent report that a source said: "Discussions in the drafting are trying to take the view on how much the collapse was to do with Metronet and the London Underground." The report is now expected to come out by Easter. 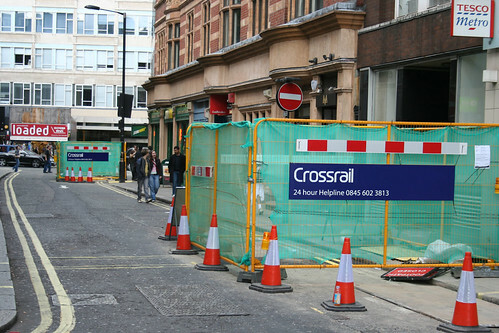 Sorry about the short notice, but if anyone's interested in the challenges of tunnelling underground and the issues facing Crossrail there's free lecture tonight hosted by the Royal Society. "Urban congestion is a serious problem in many cities, so the creation of underground space and in particular the development of underground transport is environmentally essential. How can tunnels be built in ground sometimes as soft as toothpaste? What can go wrong? Will buildings above be affected by subsidence? What else is underground already that might get in the way? Geotechnical engineering, the application of the science of soil mechanics and engineering geology, plays a key role in answering these questions." This lecture is free - no ticket or advanced booking is needed. Doors open at 5.45pm and seats will be allocated on a first-come-first-served basis. If anyone goes and fancies doing a guest blog post for me, it'd be much appreciated as I'd like to know how a lot of this new tunnelling is going to work. Full details are on the Royal Society's site and apparently there will be a live webcast of the lecture too. 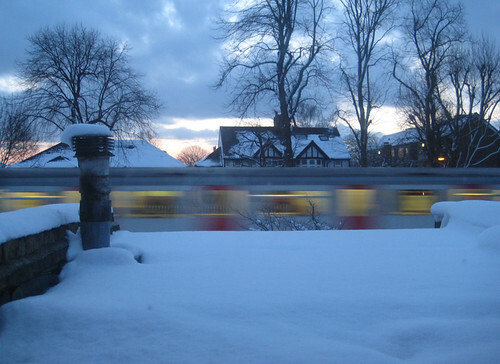 My friend and neighbour Richard from Essential Travel, took a picture of a fairly rare sight on the District Line. 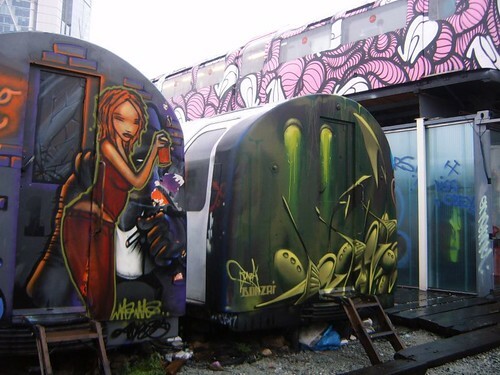 Yesterday a graffiti'ed Tube pulled into Kew Gardens and it certainly took both him and me back to those 1970's images of New York subway trains where graffiti was part of the paintwork. 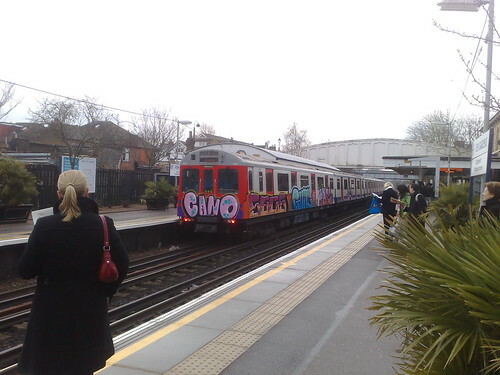 He thought that the London Underground had some rule that a train wasn't allowed to go in service, if it had been hit by graffiti. I'm not so sure. Admittedly I don't see a lot of trains around with graffiti on them, or perhaps it depends on the level of graffiti, before a train's taken out of service. 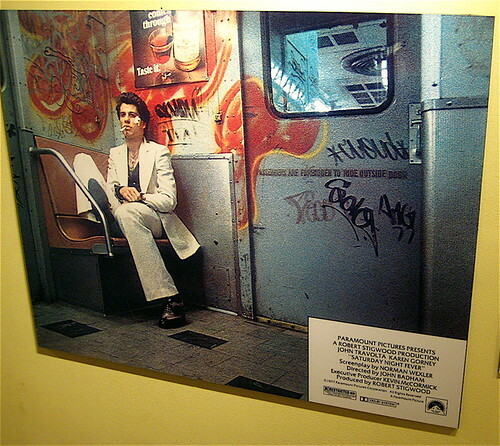 When I was in New York last Autumn, I visited the New York Transit Museum and they were so anti graffiti (or perhaps so proud of the crack down on it) that they wouldn't show any carriages with graffiti, even from a historical perspective. The closest they got was this iconic image of John Travolta from Saturday Night Fever sprawled in a subway carriage. All the subway shots were filmed inside the museum and one of the guides remembered chatting to Travolta when he came in. 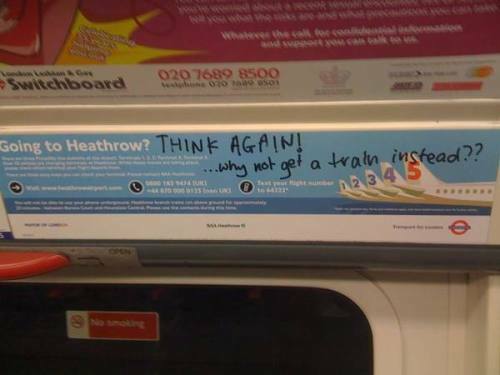 People still have very strong opinions about graffiti on trains (and graffiti in general). It's regarded as street art in some circles. People like Banksy have certainly popularised the idea that urban art is not only that (ie artistic) but that it's also worth a pile of money. I know a number of people who thought that the Tube Carriage offices in the sky were just an art installation and not real offices. Perhaps there ought to be some places where graffiti artists can spray away to their heart's content. Maybe they'd be less inclined to climb onto lines overnight and spray trains. Having this discussion before, Jon Justice found a video of some reverse graffiti, where a guy used dirty real life canvasses and left clean images on them. It's like a more artistic way of writing "clean me" on a dirty white van. Hopefully the killjoy sign at Warrington Station wasn't put up on Valentine's Day. 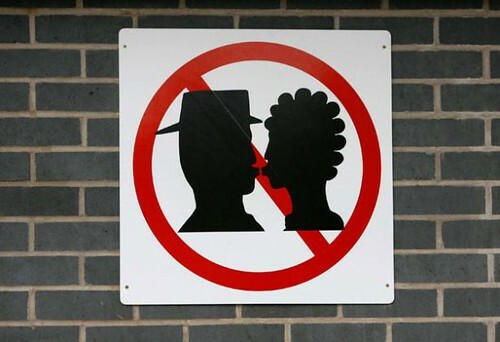 The station has now been separated into "kissing" and "non kissing zones" as part of a £1 million refurbishment. Colin Daniels, chief executive of Warrington's Chamber of Commerce said: "It is a fairly congested station and ideally what we want is for people to come here, drop someone off and move on. But that wasn't always happening and people were lingering and causing delays. "With these 'no-kissing' signs we are pointing out that we don't want people doing that right outside the front of the station. If they want to linger and say a longer goodbye they can do that in the 'kissing zone' where there is a limited amount of parking." Radio 4 have a brilliant interview with Ken Gibbs from Virgin Trains who's trying to play down the story and suggest it's just a light hearted way of getting the message across. I don't know why they didn't get the Japanese in for the signage. They wouldn't have messed about and would have come straight to the point. Kissing leads to well .. err ... you can see what it leads to below. Sadly the priority seating sign above turned out to be a spoof! However, I wonder who's actually going to enforce the "no kissing" zones in Warrington? How long will it take for TfL to catch onto this idea and have "no snogging" signs on the Tube? He saw this in a local shopping centre. "It was located on the "underground" floor of a shopping complex in Kwai Fong, Hong Kong". 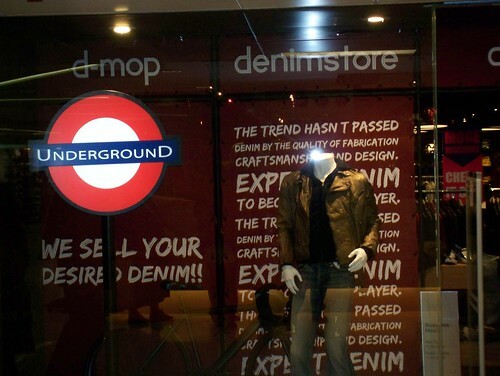 I spose being underground means they thought they had license to use the roundel. 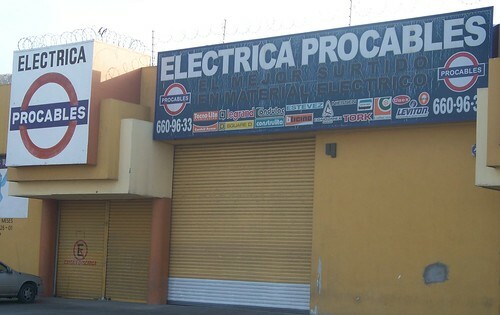 From Hong Kong to Mexico - Julio spotted this from a local electrical supplies store which used the roundel in Tijuana. 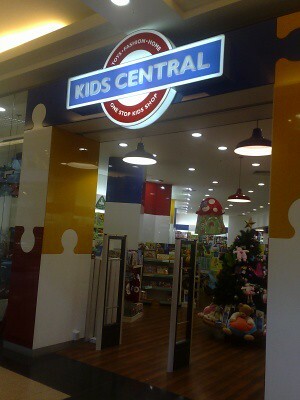 Apparently the children's shop didn't have a railway theme, so not sure why the roundel logo was appropriate. The final one isn't a current roundel spot, but I like that someone somewhere thought it was once a good idea to make a shirt and a pair of culottes or Twiggy trousers covered in roundels. Thanks to I.P for sending this one through. If anyone can speak Russian you'll find out its origin. 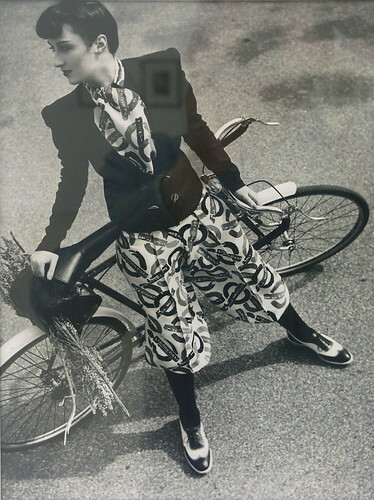 It was taken by Norman Parkinson. Thanks to all who sent them in. The set of Roundels not on the Underground is here and please feel free to mail me any you spot on your travels, and I'll try to get round to blogging the next ones sooner. 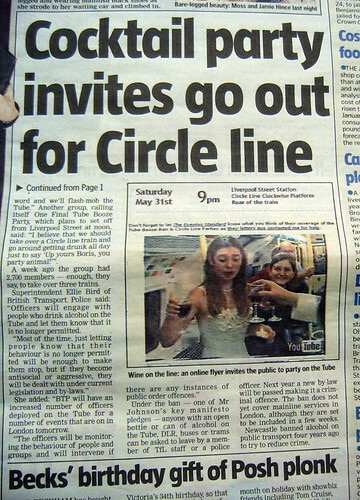 It was great being on the Tube yesterday to see Twestival on the front cover of Metro. In a nutshell Twestival was a big global party for people who Twitter, set up to raise money for Charity : Water. Over 200 cities took part and I'm pleased to say that was one of the few major tech / Web 2.0'ie events that was set up from London. Loads and loads of people helped to put the event together, but Amanda Rose deserves extra special kudos for hardly getting any sleep & making sure it went truly global. She is a lovely understated person too and hopefully we be able to sleep soundly again. 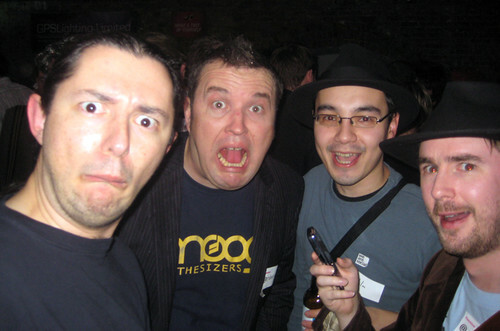 The rest of my photos from London Twestival are here, but there will be gazillions of Twestival pictures from around the world to see too. See the Tube run like clockwork and get the chance of winning a prize, as the London Transport Museum are holding another Flickr photographic Scavenger Hunt. However, for the first time this will be at the Depot in Acton. 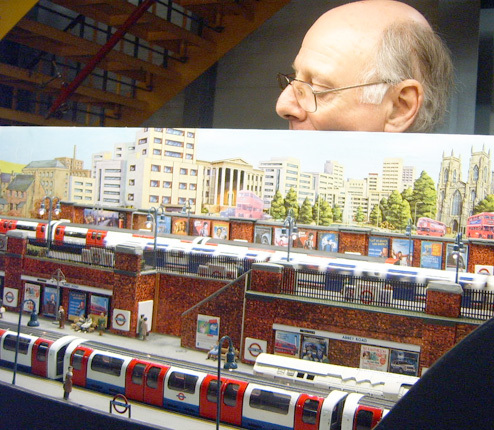 It's part of the Museum Depot's London in Miniature Open Weekend which runs from the 7th - 8th of March. "You can test out your creativity by solving the clues to capture things both big & small in this fun setting. Prizes will be on offer as well as a chance to contribute to the Museum's growing photographic collection. To sign up please email communities@ltmuseum.co.uk Places are limited and will be allocated on a first come first served basis." The Scavenger Hunt takes place on Saturday 7th of March and full details of timing can be found on the following Flickr Group which it's worth joining to show interest, but please also email The Communities Team at the Museum if you want to take part. 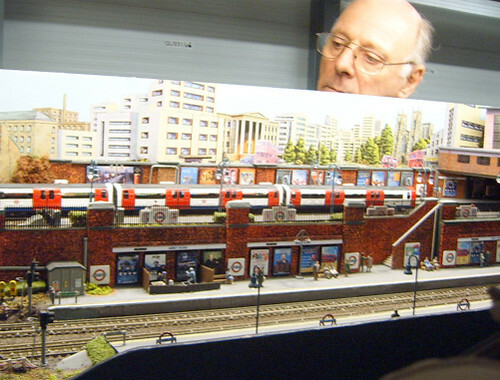 I've not been to the Museum Depot for a few years (here's when I was at the Transport in Miniature Open Weekend) so am looking forward to the hunt. The clues are being put together by my friends Cowfish, Mondoagogo and Blech (aka Billy, Anna and Paul) who are Flickr Scavenger Hunt aficionados so I'm imagining there'll be some inventive & challenging clues, with some great photographs at the end. TfL boss, Peter Hendy will have some tough questions thrown at him today at London's City Hall. He's part of a London Assembly Meeting about transport. On the agenda is a "response to the extreme weather conditions", when London's buses were taken off the road and the London Underground ran a massively reduced service on Monday 2nd Feb.
Look forward to seeing what comes out of this. If you're at St James's Park London Underground station today, look out for a number of members of the RMT and TSSA who will be handing out leaflets about the redundancies which TfL announced last week. Although London Underground say that the loss of 1,000 jobs will not make any difference to the service, the unions don't believe this. They're also demanding that their employers "come clean" about the number of job losses. The "noisy and colourful" protest will start at 8am today. RMT leader Bob Crow said "It is scandalous that loyal Tube workers doing their best to provide a service to the public should have to pay with their jobs for a financial crisis that is none of their making"
"There is no way that job losses on the scale planned by TfL can be implemented without affecting services, and it is sheer nonsense to suggest that there are hoards of superfluous workers that can be weeded out. "We have made it quite clear that any attempt to impose compulsory redundancies among our members or to undermine their terms and conditions will be met with a ballot for industrial action". 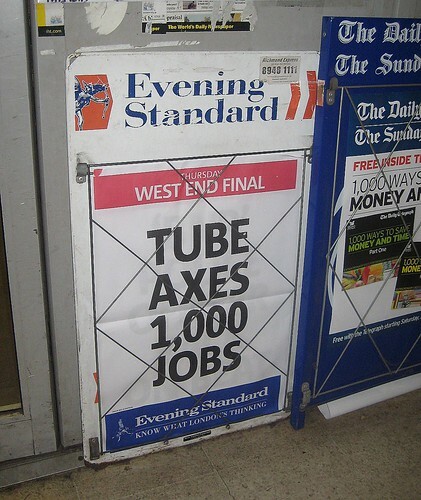 Some Tube staff made comments in my post on the announcement of the redundancies, saying that they wouldn't be prepared to strike because of this and that the losses were only from duplicated jobs as a result of the London Underground & Metronet merger. I wonder if today's protests will make any difference. 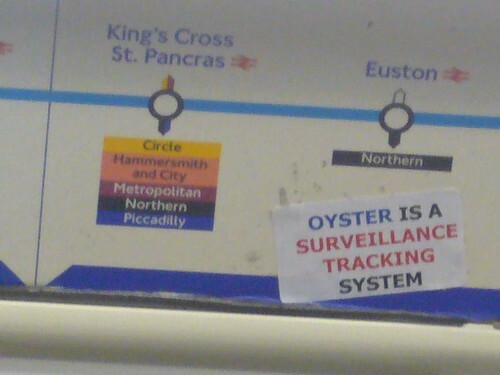 Another spoof sign spotted on London Underground. This was snapped by the eagle eyed Adrian Fitch on the Victoria Line on Sunday morning. It'd be difficult to know if this one was actually fooling tourists though. It's a subtle warning of a Penalty Fare if you fail to hide your true emotions fully or make any attempt to engage with passengers. I suppose most tourists would naturally think that we all follow it. If anything it might make a few groups of loud tourists (usually from across the Pond!) stop reading out all the station names on the line maps in the the Tube and asking everyone how many more stops before Lie-chester Square! 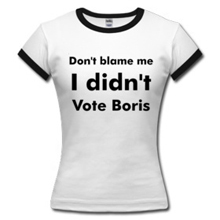 Mayor Boris Johnson appears to have made a U turn with his comments about docking the pay of London Underground workers who couldn't get to work last Monday due to the snow. Boris said he had "absolutely no intention" of penalising tube staff after the Transport Salaried Staffs Association (TSSA) revealed yesterday that ticket staff and other operational staff working for the Tube had been told they would have to take a day's holiday or lose a day's wages for failing to turn up to work last Monday. Weirdly today's Metro hasn't caught up with Boris' latest words and seems to under the belief that workers may still get their pay docked. However, from The Guardian's report a spokesman for the mayor said: "The mayor has absolutely no intention of penalising anyone who failed to get to work due to last week's exceptional weather. More than 95% of London Underground's operational staff made it to work last Monday and the mayor is grateful for their efforts to get as much of the tube running as was possible in the circumstances. "Around 100 employees were unable to make it to work that day and their managers are simply following normal procedure by making sure that all absences were due to the weather." Gerry Doherty, from TSSA, said: "This amounts to a U-turn. We are delighted that the mayor has seen common sense on this issue. Staff should not be penalised because of his decisions and we welcome the fact that he has now recognised the justice of their case." 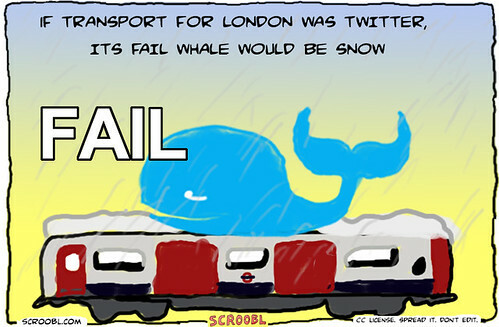 I must thank Jonin60Seconds for the Twitter inspired Snow Fail Whale at the beginning of this post, and it looks like with Boris's latest change of mind, an older transport Fail Whale is appropriate. Let's see how he tackles the current row as it also emerged yesterday that TfL's top managers paid themselves more than £17m in salaries and bonuses last year. These figures, obtained under a freedom of information request, are particularly galling as the news follows the above-inflation fare increases we were subjected to last month. One hundred and twenty-three TfL managers earned more than £100,000 in 2007-08. In contrast, the Treasury, responsible for the entire British economy, had just 15 six-figure earners. The Guardian has more on this and it's interesting to note that "The list of top jobs provided includes many with apparently overlapping job titles and descriptions, but there appeared to be nobody whose main responsibility is reducing the impact of TfL services on the environment, according to the Standard, nor any post with a job description which includes emergency or contingency planning, which includes dealing with extreme weather conditions." Tim O'Toole, Managing Director of the London Underground, made an apology (sort of) on London Today, ITV's local news last night. He said: "We're sorry that our people endured the same conditions as they did struggling to get to work. But, they have to know we worked very hard with hundreds, literally hundreds of people out last night, clearing the network to make sure we could offer them a service this morning." Transport for London commissioner Peter Hendy also apologised for the disruption to the service. He told the BBC "It was the worst snowfall for two decades. The local authorities deployed everything they had on Sunday night and Monday morning, but it just wasn't enough for the circumstances." But with more snow expected on Thursday & Friday, and the Met Office saying "Be prepared", will our transport system cope this time? Stephen Almabritis from the Federation of Small Businesses is unhappy, as the disruption cost the UK economy an estimated £3.5 billion. He said "One of the world's biggest econimies should not be grinding to a halt, even if it is only once in every ten years. We are calling on Boris Johnson to call in the mayors of cities including Ontario, Vancouver and Moscow and just pick their brains. What is it they do that we don't?" After yesterday's "Arctic" conditions, with London's worst snowfall in 18 years, looks like we will have an easier journey into work this morning. Most of the London Underground seems to be working and at time of writing (7.20am) only the Circle Line is completely suspended due to a broken down train. There are part suspensions on the District, Bakerloo & Hammersmith & City Lines, so check the Tube's website before you leave home. Here's the view from my study today, with the District Line coming in from Richmond, so err... luckily, I'll be able to get into town. Most of the main roads have been cleared of snow, so most of London's buses are back on the road. 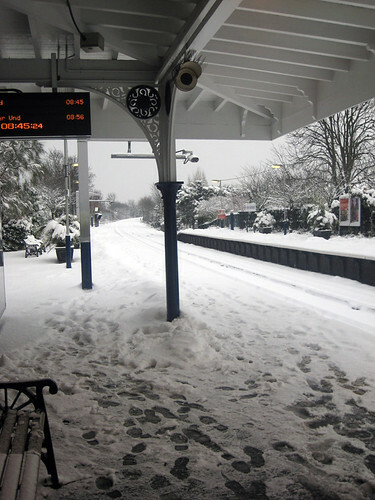 However TfL said "Five routes are currently suspended linked to the volume of gritting taking place on local roads and there may be reduced services on some other routes." "There's no doubt about it, this is the right kind of snow, it's just the wrong kind of quantities. "My message to the heavens is: 'You've put on a fantastic display of snow power but that is probably quite enough'." I like how in yesterday's interview above Boris manages some clever avoidance. Johnson says "We've actually been quite successful with the Tube network". The interviewer responds rather quickly with "If this was successful I'd like to see what unsuccessful was like".